Morrison's has today revealed a new positioning that shows the supermarket as a lower-priced retailer as it seeks to take back market share from the likes of Lidl and Aldi. The brand positioning, "I'm you're new cheaper Morrisons", will feature the retailer cutting the cost of more than 1,200 items in-store and online. A supporting campaign, created by DLKW Lowe aims to capture the UK's love of food through a series of everyday moments – the way a dog will plead for a piece of sausage, the way someone will pinch the best bit of food off of their partner's plate when they are out of the room; the reams of cling film that will get used to wrap kids' sandwiches. 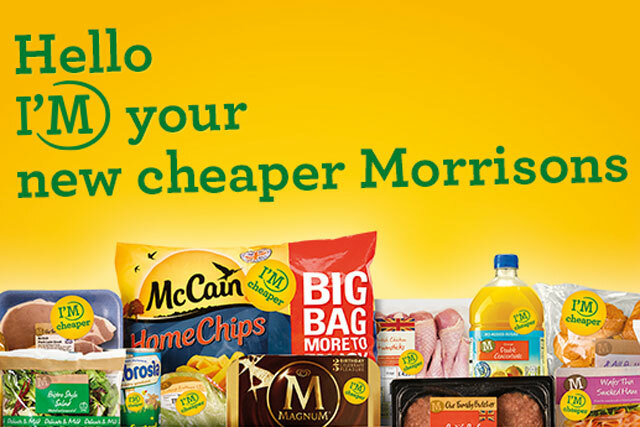 Each ad shows an everyday food item that is now permanently cheaper at Morrisons, using a "Love 'em cheaper" strapline. The supermarket is also launching a 'Pricecuts' page as part of its Morrisons.com site, designed to show how much cheaper its food is. It is powered by Mysupermarket.co.uk in order to provide a transparency model for consumers to be able to view the pricing history of an item. Belinda Youngs, corporate brand marketing director of Morrisons, said: "This ambitious multi-channel marketing campaign clearly announces the significant price cuts we have made on over 1,200 prices that matter most to customer. "It is the start of a clear brand positioning for Morrisons as a value-led grocer, committed to making good food cheaper".